GSIDC | Construction of bridge across river between Aldona and Calvim. Construction of bridge across river between Aldona and Calvim. 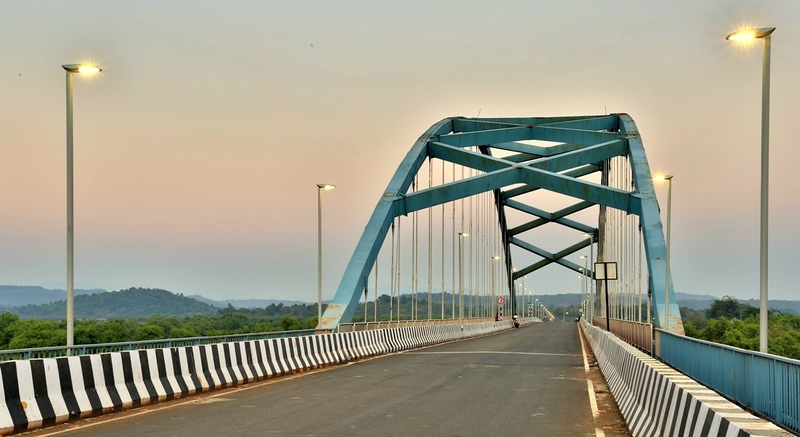 The bridge between Aldona and Calvim makes crossing the river a breeze during the monsoons. Villagers were earlier dependent on the ferry, which was time consuming. Design parameters : The bridge is designed conforming to IRC standards. Bridge is a two lane bridge with footpaths on either side. 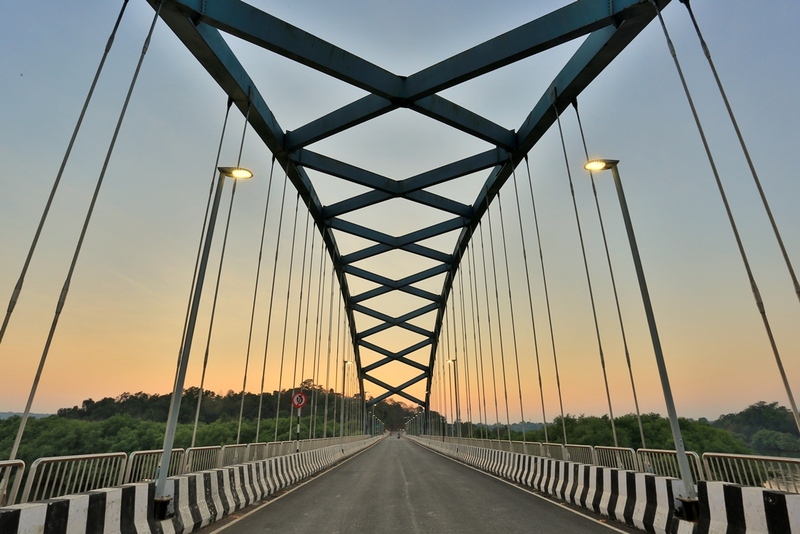 Total length of the bridge is 494 m and carriageway width is 7.5 m. The navigation span of the bridge is 120 m.The approach road on Aldona side is 320 m and on the Calvim side is 100 m.
Foundation : Pile foundation is of 1.2 m diameter and average length of pile is 35 m. The grade of concrete for pile foundation is M40 concrete with 8 mm thick liners. Navigational span is of 120 m which ensures that foundations are on the river banks and there are no obstructions to water flow and navigational traffic in the river. Substructure : Comprises of RCC plate piers, RCC pier cap with pedestals. Superstructure : Comprises of composite steel construction. RCC deck slab is supported on steel work spanning between piers. Steel work comprises of plate girders for 34 m span. 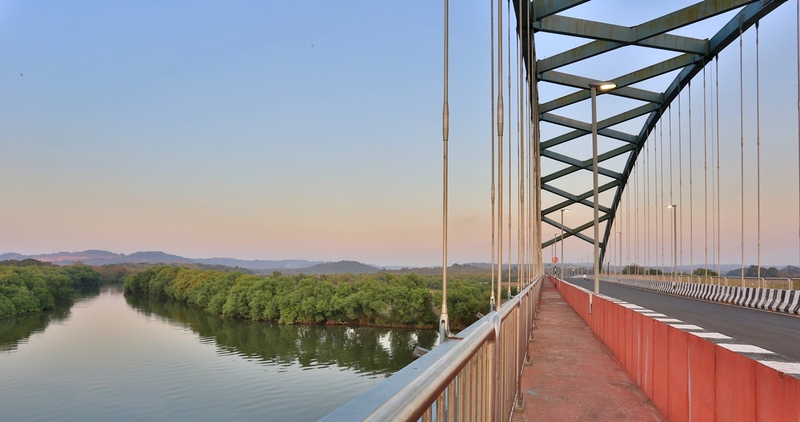 Navigational span is 120 m steel arch with height of 20 m. Arch suspenders comprise of high strength stainless steel rods. Bearing : All bearing provided are POT PTFE type bearing. Expansion Joint : Strip seal type. Minimum numbers of expansion joints are provided to improve the riding quality. Wearing Coat : Asphaltic concrete wearing course. 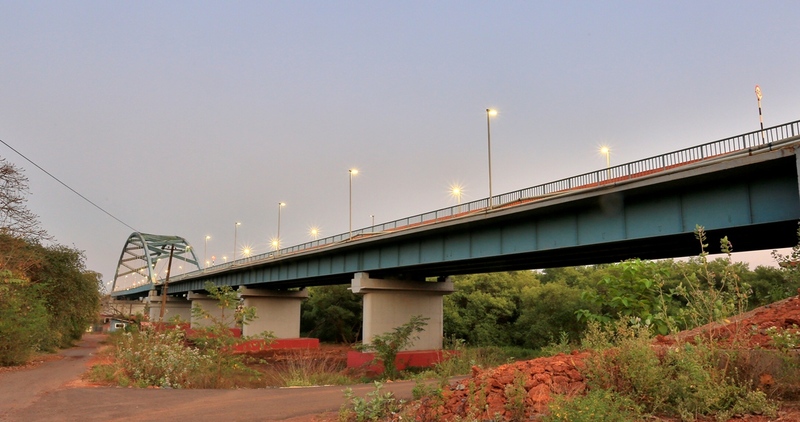 Lighting : Entire bridge lighting is carried out with high quality LED fittings as specified in tender. Entire arch is lighted with special LED light to give a very elegant look. Improvement and Upgradation of the existing MDR from Dandevaddo to Chandor via Sarzora and Guddi in Cuncolim Constituency. 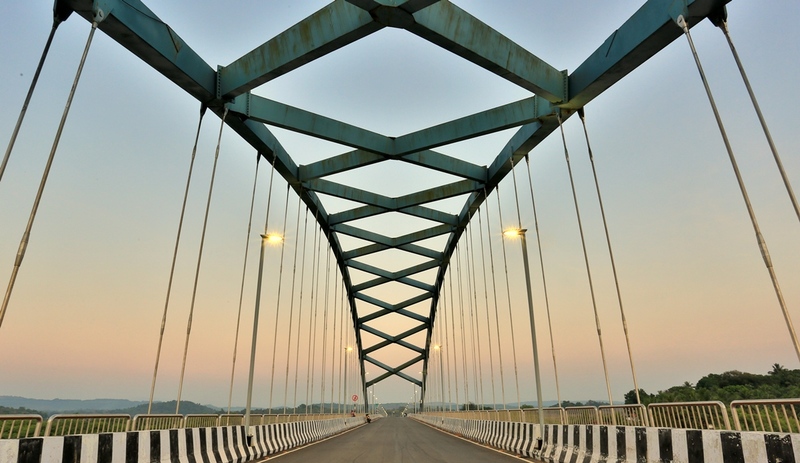 Design and Construction of Bridge at Ambeshi – Ganjem over Mhadei river.